Evangeline is a haunt huntress in training. She's being taught how to rid the world of spirits, banshees, and pretty much any monster in existence. But when a job takes her and her Gran to New Orleans, they get more than they've bargained for. 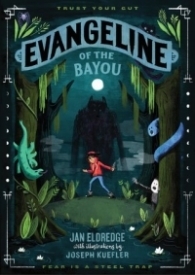 In New Orleans, Evangeline meets a reclusive Julian and his mom and dad. His mom is plagued by something that no medical physician can diagnose, so the haunt huntresses are her only hope. Their worst fear appears in the form of a Rougarou, which is a Louisiana legend. When Gran gets hurt, it's up to Evangeline to finish the job and save Julian's mom. It was exciting waiting for Evangeline's familiar to show up because I was eager to see what form it would take. I also really enjoyed the Cajun things in it that are signature to the south, like jambalaya and the rougarou. Being from Louisiana, it was neat seeing those aspects of the story play a part like it does in my every day life. Final Verdict: This is perfect for fans of monsters, action, adventure, and myths. It's a Louisiana legend morphed into a story.